There’s no question that AMD has stolen the thunder over the past few weeks with the launch of their highly anticipated Ryzen CPUs, but Nvidia wants you to know that they have something coming out as well. Nvidia recently added a popover on their site which includes a countdown timer that’s about 6 days and a bit away (February 28th) with the line “IT’S ALMOST TIME #ULTIMATEGEFORCE” with the bolded TI of course referring to the upcoming flagship GeForce GTX 1080 Ti graphics card. No additional details of the upcoming GeForce GTX 1080Ti were provided at this time however, according to previous rumors, the GeForce GTX 1080 Ti is expected to be a cut down version of the Pascal Titan X featuring a GP102 GPU. 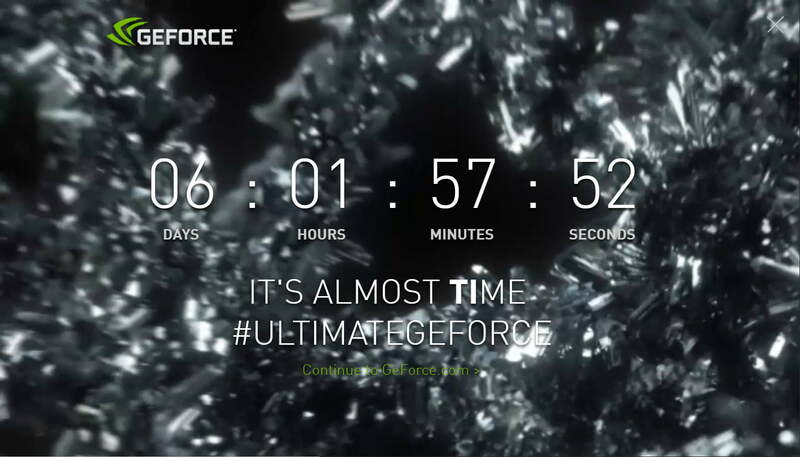 Nvidia will also hold a fan event on the same day as the GeForce GTX 1080 Ti launch event at 6:30 PM although good luck getting in as tickets are already sold out at this time.